Known for having the ability to withstand long bouts of direct sunlight, chrysanthemums, or mums, make good flowers for the garden and the house. Many varieties of mums are available and come in most every color in the rainbow. However, even the strongest plants wilt and begin to die without proper care. If your chrysanthemum's blooms are wilting and the flower isn't producing new blooms, it's time revive the plant with a little extra care. Mums are available in a variety of colors. Clip the leaves and wilting flowers -- at the base -- from the plant, using shearing scissors. Removing dead blossoms allows the mum to bloom again. Ensure that the planting pot is the proper size and has drainage holes in the bottom, as the roots of mums are susceptible to rot if left in standing water. If the planter doesn't drain water, switch to a pot that does. 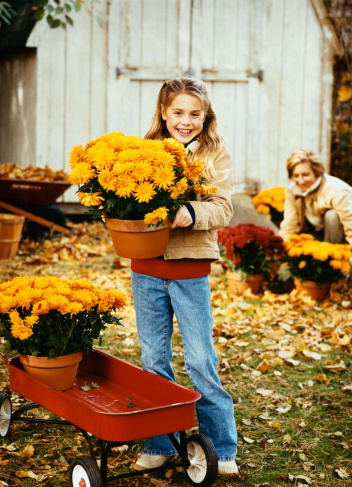 Water the mums every two days to keep the soil damp. Mums won't grow properly if over-watered. 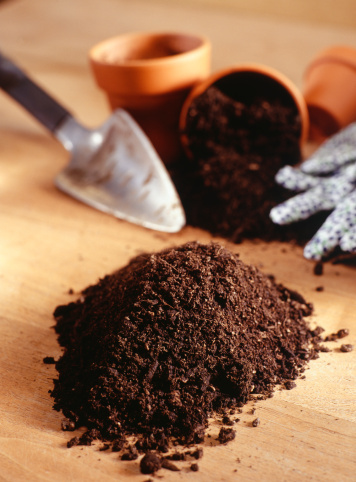 Don't let the soil fully dry out before re-watering. Place the plant in a window and allow it to absorb natural sunlight until new blooms appear. If a window that gets a lot of natural light is not available, move the potted plant outside until it heals. What Flowers Have Big Blooms? How Often Do You Water Poinsettia Plants?